Suhr's Hum Cancelling System Now Available For YOUR Strat! BPSSC "Back Plate Silent Single Coil" from John Suhr WILL eliminate all 60 cycle hum from your Strat. Period! This is a major upgrade for Stratocaster owners. Installation is easy-- so easy, even a caveman can do it*. Scott Henderson demo's the Suhr BPSSC in these videos. You once had to buy a Suhr guitar to have the BPSSC system. 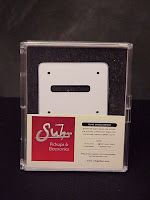 Now, Suhr has packaged the system in an after market replacement back plate for any Strat. Yes, there are low noise single coil pickups on the market, but the Suhr BPSSC system allows you to retain your original/favorite pickups. This system also promises not to alter the tone of your pickups-- as other "solutions" typically can. A bold statement, but Scott Henderson believes so and demonstrates it. Watch the video!!! *NOTE: Some current Strat models configure the center pickup in reverse polarity to help cancel hum. The Suhr BPSSC will not work with this configuration. CLICK HERE for more details at the Suhr website, including a complete installation PDF download link. Whole Tone Music "We carry Tone Tubby speakers, Eminence speakers, Groove Tubes, JJ Tubes, TAD tubes, Winged C tubes, Gibson and Fender parts. We want to help you customize your tone!" AMP-SHOP "SOLDANO, BOGNER, ENGL, CARR, DIEZEL, ORANGE, THD, Blockhead, KOMET, RIVERA, Heritage, Groove Tubes, DEMETER, EBS, EDEN, Aguilar, Gallien-Krueger, Ashdown, AER, ESP, SUHR, HERITAGE, Floyd Rose, GODIN, Fernandes, FODERA, Fbass, Lakland, MTD, ROSCOE, Sadowsky, Ritter, BOSSA, Music Man, G&L..."
Current eBay Results: Check eBay STORES merchants. DiMarzio Area 58 & Area 61 Strat pickups.